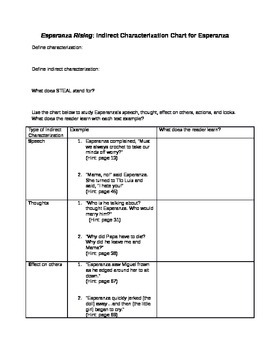 After reading to at least chapter six in Esperanza Rising, encourage a deeper analysis of Esperanza's character traits with this two-page worksheet. First, learners define characterization, indirect characterization, and the STEAL acronym, and then they use strategically chosen text examples to make inferences about Esperanza's character. Studying specific text examples encourages a closer read and asks the students to consistently reference the text when making a claim. 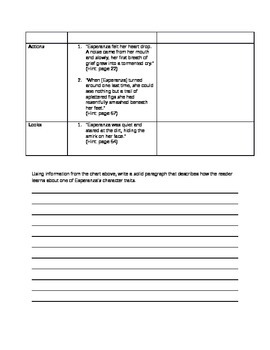 After completing the characterization chart, students will write a solid paragraph that describes one of Esperanza's character traits. Please rate this product after downloading; I would really appreciate the feedback!